A roosted hen turkey fidgeted overhead. A starry night sky, grayed by a full moon that hung 3 o’clock high over the western horizon, backlit the bird’s sleek black shape. Bony legs stepped sideways. Skeleton-like toes flexed as they gripped a forearm-sized limb. The turkey’s skinny neck stretched; its head turned to the right. The bird uttered a soft, quick cluck. A half-dozen trees to the north, another turkey putted a slow and quiet answer. Yet another joined in. Partly-damped leaves whimpered under my buffalo-hide moccasins. 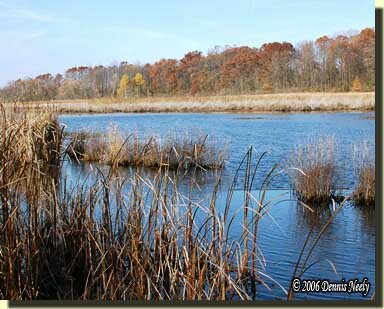 Despite stalking into the midst of a roosted flock I held to the trail that came close to my objective: a modest oak, ten paces from the west edge of the big swamp, forty or so paces downwind of the narrows. My moccasins left the trail and stepped between two twisted grape vine trunks, suspended from separate trees like a ship’s mooring ropes. My left shoulder brushed a vine. The movement must have wiggled branches above, because an unnerved wild turkey took flight with a cackle, flapping hard then coasting to a tall oak on the far side of the big swamp. Five footfalls later I cleared the leaves from beneath my oak, shouldered a trade blanket and sat cross-legged with a butterfly’s breath of breeze in my face. From my lair I could view four crossing trails and also watch the lower paths on the hill I had just descended. As first light arrived, the turkeys began putting, clucking and chirping in soft, mellow tones as if they were invisible in the leafless tree tops. Turkey sounds surrounded my oak, but nary a deer moved about. Now and then big wings thrashed; one bird thumped hard in the leaves, 40 paces behind, I estimated. With no deer chasing about, I amused himself with the bronze fowls. The wild turkey behind me began an incessant series of yelps, most were five screechy “arks” in duration, separated by three or four seconds. Across the swamp, not far from the hollow raccoon tree, another turkey sung a similar chorus in competition with the first. A third joined to the south and then a fourth to the west. Birds started gliding from their roosts. Immersed in the moment, I found the experience fascinating and frustrating, all at the same time. “Ambush!” I thought, surprised by the sudden musket blasts; my heart began racing. The thunderous roar echoed in the river bottom, south to north. “Nine shots; near the lily pad flats on the river,” I guessed. My thumb pressed hard on the Northwest gun’s hammer as I looked uphill, in the general direction of the clamor. Our party had no hunters in that area; I wondered just long enough for everyone to reload. “A defensive shot and then a volley of seven. An unfortunate soul died, no doubt,” I said in a bewildered whisper. In the silence that followed, I started wondering why the musket blasts were not steadier with a bit of spacing. “Had they not alternated fire, one shooting and reloading while another reserved fire?” I whispered. I make it to that oak about once a season. My habit is to never sit in the same area for seven days—the old does know and keep a vigilant watch. On a normal morning the four trails are a busy thoroughfare, but with the scarcity of white-tailed deer, I only hoped to see one or two does cross on that crisp November morn. My moccasins danced over time’s threshold before I ever left the wagon trail and started downhill—it was 1795, as it had been throughout that season. After I discovered the first roosted turkey the hunt’s complexion changed, a chance to hone a rare woodland skill, to pass among a flock of turkeys with scaring them to flight was the new test. Looking up at a wild turkey hen silhouetted against a gray, starry sky cemented my mind in the long ago, in the Old Northwest Territory, about a half mile east of the River Raisin. Mesmerized by the circumstance, I slipped deep into character, intent more on outwitting the turkeys than seeing deer, much less taking a shot at a fine buck. To my delight, the bird overhead stayed put after first light, offering a soft purr or a gentle cluck, now and then. With only two days remaining in the fall waterfowl season, duck hunters floated the River Raisin. Their first volley caught me by surprise, but in hindsight what really surprised me was my period-correct reaction. After the second shot, I thought “Ambush!” and began pinpointing the blasts in relation to the river’s geography. My heart pounded and I felt my right thumb press hard on “Old Turkey Feathers’” hammer. In less than the time it takes a good traditional woodsman to reload a smoking trade gun, I heard the second volley, maybe a hundred yards farther downriver. A second or so hesitation separated the first shot from the last seven; my 18th-century mindset interpreted the delay as a defensive shot, followed by a killing volley. “An unfortunate soul died,” was all I could think of, primed, perhaps, by reading of an unforgettable sequence of events in John Tanner’s journal a few weeks before. In the next skirmish, a favorite son of Ais-ainse, the Little Clam, was killed, scalped and stripped of his “medal.” The Sioux warriors taunted the Ojibwa with the scalp and medal, which enraged Little Clam who attacked the Sioux. Hearing the shots and being told of what was happening, Ta-bush-shish gave one of his fine horses to Be-na and the two Ojibwa warriors rode off to help Little Clam. Ta-bush-shish and Be-na found the trail of the Sioux, and came upon them as they rested around a freshly kindled fire. When I read this last passage, I remember thinking how the shots surrounding the death of Little Clam’s wife and that of Ta-bush-shish were not consistent with what I had read regarding the wilderness practice of reserving fire when engaged with an enemy. At the same time, I considered the emotional frenzy the Sioux warriors must have experienced upon cornering Ta-bush-shish in the night. My response that morning has been the source of a number of reflections and cogitations, mostly when I sit in the woods. On the one hand, I am thrilled that I was that engrossed in my characterization to have such thoughts, and on the other, I question the period-correctness of those thoughts. 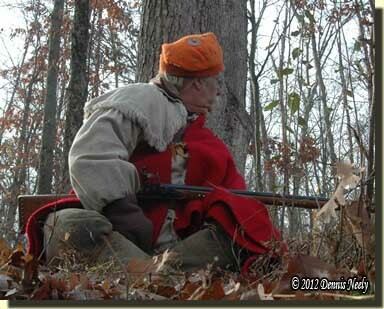 It is only natural; it is what we do as conscientious living historians and traditional black powder hunters. I have come to realize the sudden surprise of the situation triggered the chain reaction of thought within my characterization and that the profound silence that followed the second volley from the duck hunters was the emotional catalyst that pushed me to the 18th-century conclusion that “an unfortunate soul died”—funny how the mind works. 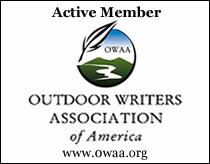 This entry was posted in Deer Hunts, Persona, Scenarios and tagged Dennis Neely, historical trekking, North West trade gun, Northwest trade gun, traditional black powder, traditional black powder hunting, traditional blackpowder, traditional blackpowder hunting. Bookmark the permalink. When you mention in JohnTanner’s journal that two elks had been killed, understanding that Obibbeway were a northern tribe, is it likely that they were actually moose? In his narrative, Tanner speaks of taking both elk and moose, and depending upon the hunting story, makes a clear distinction between these two animals. I can soooooo relate to that first picture Dennis. Thanks!